Luxury Custom Homes. What constitutes a luxury home? What is a custom home? Are the two the same? Of course the definition of what constitutes a luxury home differs by location. In many parts back East $550,000 will buy you a four-bedroom, five-bath, 4,500-square-foot home on better than a 100,000-square foot lot. In California the same money may get you a four-bedroom, three-bath, 2,000-square-foot house on a 5,000-square-foot lot. Americans like to dream — and, for many, perusing upper-bracket listings feeds those visions. Most of the trends in housing show up first in luxury homes and then make their way down. Learn about custom and luxury housing or click below for related topics. What features are truly luxury and not just a large family home? Luxury doesn't just mean size anymore, either, but luxury appointments. You don't have to have a 5,000-square-foot house to say you live in luxury. A 2,500-square-foot home that's very well appointed will do. Of course Estates, mansions, castles, villas, log homes, seaside homes and overseas property all qualify. Some luxury homes may have some exceptionally luxurious features such as an interior lap pool, an art gallery, a workout room and a dance studio. Upper bracket. Those two words on a real estate ad will signal one thing for sure: If you have to ask the price, you can't afford it. Across most of the United States, even in a soft economy, there are still a lot of people who don't have to ask. In high-end, luxury living, if you have the right site, the right location, regardless of the economic conditions, you are going to be able to sell that property as a luxury property. What is the difference between a large luxury tract home and a custom home? There are an increasing number of large (4,000+ square foot) tract homes that are billed as luxury homes. Although these homes do have some luxury home features, there is a difference between a custom home and one that is built in a subdivision. What are the hallmarks of a luxury home? There are several design features one can point to. One measure is that many luxury homes have more bathrooms than bedrooms. In California, where cars are part of the culture a luxury home has a 3 car garage minimum, but usually has a garage for four vehicles or more. 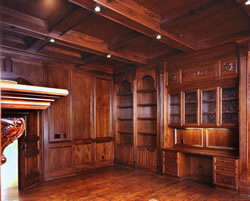 Taller ceiling height, larger door and room size and other hallmarks help to further distinguish luxury homes. No matter how you define a luxury home, the market is growing. The aging baby boomer generation, in particular, is driving sales of everything from chic downtown condos to custom suburban homes as most of those individuals enter their peak earning years at the same time they cash in on home equity and inheritances. Today every boomer either is or shortly will reach the empty-nesting life stage. This life stage marks a dramatic shift in consumer spending, away from needs-driven purchases for home and family and more spending devoted to personal luxuries. Property in the best locations, which often would define a luxury setting, often proves to be a good investment. And while price may not be an obstacle, people buying expensive homes are benefiting every bit as much from today's 45-year-low interest rates as other buyers. Historically, low interest rates make high-end homes very affordable. Buyers are attracted to the low carrying costs, realizing that even if prices decline somewhat, increased interest rates could make their desired home much less affordable. The upper-bracket market in North County San Diego, home base for many wealthy individuals, has been especially strong, according to the bank's most recent luxury-market index. Prices of homes over $1 million rose more than 11 percent in the first quarter vs. a year ago, and are up 4.5 percent since the start of the year.